Father James Rogers, a priest of the Evansville, Ind., Diocese, who was ordained in 1939 as a priest of the then-Diocese of Indianapolis, died on Oct. 1 at the St. Paul Hermitage in Beech Grove. He was 100. The Mass of Christian Burial was celebrated on October 8 at St. Therese of the Infant Jesus (Little Flower) Church in Indianapolis. Bishop Charles C. Thompson of Evansville was the principal celebrant and homilist at the Mass. Burial followed at St. Joseph Cemetery in Indianapolis. Although he spent nearly all of his priestly life and ministry before retiring as a priest of the Evansville Diocese, he lived in retirement starting in 1979 in Indianapolis. Up until 2005, when he became a resident of the St. Paul Hermitage, he frequently provided sacramental assistance at St. John the Evangelist and St. Mary parishes, both in Indianapolis. He often heard confession and celebrated the 12:10 p.m. daily Mass at St. John and celebrated liturgies in Spanish at St. Mary. Father Dennis Duvelius had been ordained only a few years when he became the associate pastor of Our Lady of the Most Holy Rosary Parish in Indianapolis in 1999. He came to know Father Rogers, sought out his spiritual advice and found his priestly witness admirable. James H. Rogers was born on Aug. 25, 1914, in Beech Grove to Ora and Elizabeth (Gill) Rogers. Beginning as a high school freshman, he received priestly formation at Saint Meinrad Seminary and School of Theology in St. Meinrad. Then-Bishop Joseph E. Ritter ordained him a priest on May 30, 1939. Father Rogers celebrated his first Mass on June 4, 1939, at Most Holy Name of Jesus Church in Beech Grove. His first pastoral assignment was as assistant pastor of Holy Name Parish from 1939-41. From 1941-43, he served in the diocese’s Motor Missions, in which he traveled from town to town to preach on Catholic faith and practice. 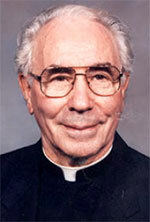 In 1943, Father Rogers began ministry as assistant pastor of Sacred Heart Parish in Evansville. It was during his time in this assignment that the Evansville Diocese was established and he became a priest of that diocese. He was assigned as administrator of Holy Angels Mission in New Harmony, Ind., in 1946. When that faith community became a parish two years later, Father Rogers was named its pastor. He served as administrator of St. Matthew Parish in Mount Vernon, Ind., from 1950-52. From 1952-69, he ministered as the pastor of St. John the Baptist Parish in Newburgh, Ind. Beginning in 1969, he served for two years as a missionary in South America in Bolivia and Ecuador. Father Rogers returned to the Evansville Diocese in 1971, serving as pastor of Christ the King Parish in Evansville and overseeing the diocese’s Spanish-speaking apostolate. Before retiring from active ministry in 1979, Father Rogers ministered as pastor of Holy Name Parish in Bloomfield, Ind., beginning in 1977. He resided in Indianapolis during his retirement and volunteered as a chaplain for the Indianapolis Metropolitan Police Department from 1979-81. From 1982 until 2005, Father Rogers provided sacramental assistance at St. John the Evangelist and St. Mary parishes. He is survived by his sister, Rita Luellen, and several nieces and nephews. Memorial contributions can be made to Saint Meinrad Archabbey, 200 Hill Drive, St. Meinrad, IN 47577, or to St. Paul Hermitage, 501 N. 17th Ave, Beech Grove, IN 46107.